For anyone in a relationship with a chef or restaurant employee you know how nuts Valentine's Day can be. First of all, whether or not your significant other is scheduled to work-you know they are busting their tail making pre fixe dinners on the 14th. And if you happen to have the day off with your main squeeze, are you willing to go out and eat on such a busy night? Oh course Erik is working on Valentine's Day and at first I thought I'd head over to BLT Fish and do the usual dinner for one at the bar then head home with Erik after he wraps things up. But as it turns out-I'm tired at 7 months pregnant! I'm not going out in the dead of winter to eat alone. So my second choice was to celebrate V Day on Monday since I assumed Erik would take Monday off. Well, I assumed wrong. Valentine's is erased this year. What are your plans? Does your chef have the day off? Will you enjoy a romantic dinner for two? Massages? Chocolates? Roses? Or something unique and completely off the wall. Last night around midnight when Erik came home he handed me a Valentine's Day card. I suppose it was the perfect time to exchange the cards since we weren't going to be together on Sunday. And really, my main disappointment was never about the holiday itself, but the fact that the last three weeks Erik has been either out of town or working like crazy. I was dreading another long lonely weekend. After I opened the card he handed me a bag of sour Skittles-man does this guy know me. 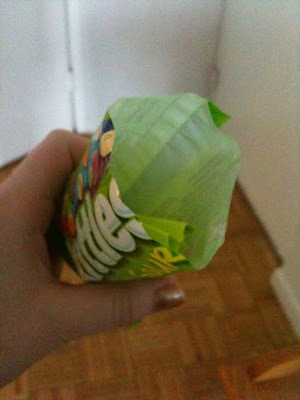 I opened the bag to find a bright green note inside. I knew right away that it must be a Valentine's Day plot, but I couldn't figure out how he did it. The my great surprise the note said that not only did he have his normal Sunday off but that we would be eating at Jean-Georges's Nougatine. And the best part-he had known for DAYS that he had the day off. I can't believe he didn't spill the beans. I am blessed to be able to spend time with Erik. Perfect Valentine's Day gift. My solution? I sent flowers to MYSELF (who says you can't anyways?) and I'm planning on taking a relaxing day by myself on Sunday. Maybe Chinese food for one and a sappy romance movie? Glutton for punishment I guess, right? I got a little kiddie valentines today too, one of the many benefits of teaching second grade. One student wrote a poem about how I'm the only teacher who wears glasses...and that's cool. Aw, so sweet. Way to go K on sending yourself flowers. Why not? I just hope every couple eating out tomorrow and Sunday will think even for a brief moment about how their chef is AWAY from his wife or girlfriend so they can enjoy some black cod or whatever. Yep, I'm bitter. My chef is working on Valentine's Day, but leaves at 5 pm. So we stay home and prepares a special dinner for 2, because I'm a little tired at this pregnancy stage, too. My boyfriend is working on Sunday (our normal day off together) because it's V-Day. But I am going to draw up a bubble bath when he gets home from work, open a bottle of Champagne and slip into a cute red negligee I bought for the occasion. Man? Check. Sudsy bath? Check. Champagne? Check. Should be a nice evening. P.S. Hilary, that is so cute what Erik did. Hope you guys have a fantastic time! I got to have lunch with my chef today. It's not an all day thing, but I'll take it. Oh my Valentine's was wonderful. After giving my boyfriend Chef a new knife, and a card I made I had to go to Florida for the weekend for work, he never responded to me at all, and we are now broken up. HAPPY VALENTINE'S DAY! So you won't see me on this blog anymore since I am officially no longer a girlfriend of a crazy chef anymore. He was the love of my life and he broke my heart. I was dedicated to him and his crazy ride called his industry. I stayed up late for drinks after he'd get off work, I got him a personally autographed book from Michael Symon, I got him reso's at Ko and took him on a trip to NYC since he never has been.... and it obviously was not enough. I am so happy that I found this blog...I'm a chefwife too, and none of my girlfriends understand it. As for Valentines, my chef was working the whole weekend too. We've been together for 10 years and 2 kids, so we don't bother with Valentines anymore. He gets me a card, leaves it on the counter, I do the same for him; Happy V-Day. I love your blog so much! suddenly I don't feel so lone anymore:) Thank you! I'm glad you had a wonderful surprise on V-day.